Launched in 2015, and edited by MATSUOKA Ryota, this bi-monthly magazine has become very popular. The number of TV shows and publications extolling the Japanese and their culture is increasing. What lies behind this trend? However surprising it may seem, the Japanese, who are known for being modest and humble and are proud of this reputation, are increasingly assailed by publications and TV programmes praising their culture, lifestyle, and their industrial and craft products. This recent trend, called “Nippon Sugoi” (Amazing Japan), is now accepted as a whole new category, but its perpetrators never fail to contradict themselves by continually extolling the humility of the Japanese people. On TV, there are no fewer than four weekly programmes of this genre that are broadcast nationwide at peak viewing time between 18:00 and 21:00. In these shows, actors marvel at the talent of Japanese craftsmen making lacquered bowls, or the strength displayed by fishermen from the north as they bring in their catch of bluefin tuna. Often, these shows invite admirers of Japan from abroad – both celebrities and tourists – to wax eloquently about the country. Apart from traditional craftsmanship, some of the most popular topics focus on the punctuality of the Japanese rail services and how clean the cities are. This is considered perfectly normal in Japan, but can seem extraordinary in the eyes of foreigners. If we’re to believe these barely credible shows – they rarely quote statistics correctly – Japan is one of the world’s most envied, acclaimed and beloved countries in the world. This phenomenon has also become evident in the publishing world over the past few years. 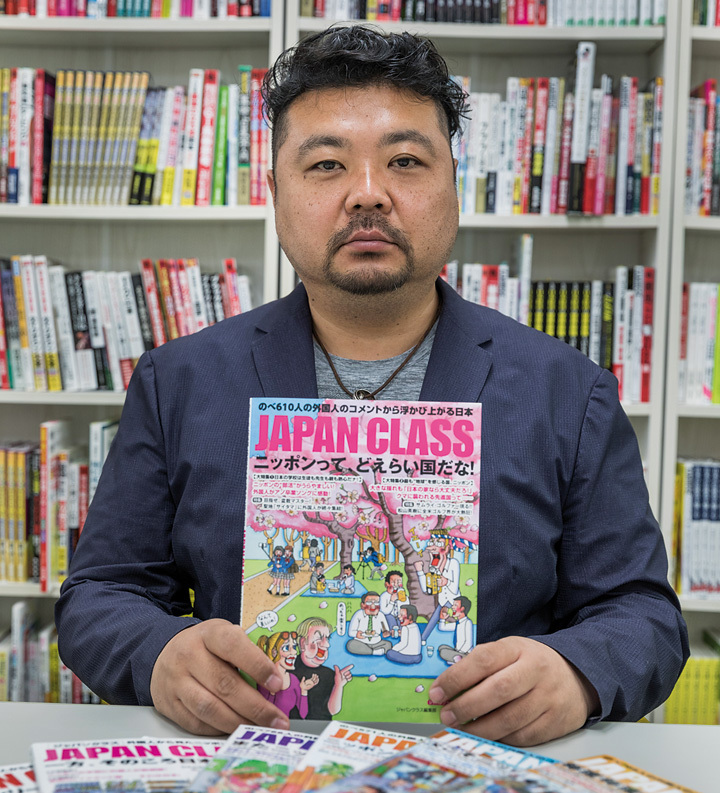 “We didn’t think it was going to be such a success”, says Matsuoka Rypota, editor-in-chief of the magazine Japan Class (Toho Shuppan). The publication’s contents – positive comments from foreigners, articles on traditions, and reports on little-known aspects about Japan to appeal to foreign visitors – are similar to the TV shows. It was launched in 2015, because “Japanese people knew too little about their country and are often unable to describe their culture to others”, says Matsuoka Ryota. But, it has to be said, their articles are sometimes inappropriate, even out of date. For instance, the magazine celebrates Japanese women who, they say, spend more time at home than women in other countries, despite Japanese society battling for increased equality between men and women. of the words you can read in Wonder Nippon, a magazine lauding Japan, produced by the ministry of Economy, Trade and industry. A large part of the magazine depends on comments and opinions of people from abroad. “It gives us confidence to promote the country’s assets that the Japanese often overlook”, says the editor-inchief. Indeed, thanks to the pages filled with quotes from foreigners, they’ve succeeded in attracting an unexpected readership. “We created it for men between the ages of 30 and 40, but now, more than half of our readership is over 60 years old”, he admits. Why are they so interested in this kind of content? “These people, born during or shortly after the Second World War, have always perceived their country in a negative light. By reading our magazine, they feel that their contribution to the country’s prosperity has finally been recognized. They get the impression that these comments justify the lives they’ve led”, Matsuoka Ryota explains. In a letter sent to the editor, a 68-year-old reader explains how the magazine helped him change his view that “Japan is backward in comparison to other countries”. “Thanks to your magazine, I’ve been able to rediscover the good things about my country, and that has helped me rebuild my self-confidence”, he adds. Nevertheless, there’s little chance that the 50,000 readers of Japan Class know that these comments are copied from the Internet and translated into Japanese by bloggers who are also the authors of xenophobic articles attacking China and South Korea. When asked about this, Matsuoka Ryota admits that he never verifies the truth of the comments, but he firmly denies the accusation of critics that it’s a nationalist magazine. “We praise Japan, but any xenophobic content is strictly forbidden”, he says. The success of this new trend has not gone unnoticed by the authorities. In February 2017, the Ministry of Economy, Trade and Industry published a booklet in English called Wonder Nippon (it’s subtitle in Japanese can be translated as “Japan amazes the World”). In 34 pages, the committee in charge of the project attempts to describe and explain the country’s culture both in English and in Japanese, with examples of how Japanese people relate to nature, traditional craftsmanship, and their unique way of perceiving beauty, called “wabi sabi”. “This booklet stems from the observation that industries such as the steel industry, which have been the foundation of the country’s growth up until now, are in decline. So now, we need to rely on our culture”, says Fukunaga Shigekazu, who’s in charge of the government project. The ministry is mainly focusing on traditional craftsmanship so as to take advantage of “the products, as well as the regional culture and personal stories of the craftsmen”. This initiative also aims to boost the Japanese provinces, the cradle of traditional craftsmanship, which has been weakened by the aging and declining population (see Zoom Japan n°39, March 2016). For these reasons, the Ministry decided to invest over £10,500 in creating the booklet, because “we wanted a document aimed at foreigners, which could be used as a manual for understanding our country’s culture”. 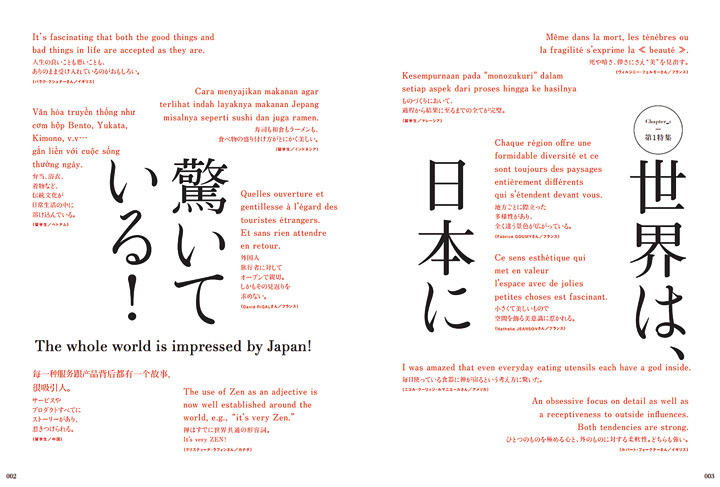 And if the booklet’s key phrases, such as “Did you know that Japan attracts a great deal of attention?” and “The whole world is impressed by Japan”, appear somewhat narcissistic, it’s because “the authors were hoping to avoid sounding too bureaucratic. So the idea was to use rather strong language in order to attract the readers’ attention”, explains Fukunaga Shigekazu. Like most publications of the kind, “Nippon Sugoi” includes a collection of surprising and even unbelievable claims. In the booklet, you’ll read that “the Japanese have a unique brain structure”. And thanks to their language, which contains lots of vowels, the Japanese are said to use the left side of their brain more, allowing them to hear the “voices” of insects, unlike Westerners who tend to use the right-hand side of their brain, and will thus hear insect “noises” instead. And this is why the Japanese have been writing about the beauty of insects’ songs since the 10th century! When asked how true this is, Fukunaga Shigekazu admits that “it isn’t based on scientific expertise”. In fact, as the committee in charge of the project mainly consists of business men, the booklet “has no academic value”. So why do the Japanese love these kind of publications? It’s true that debates about Japanese identity, especially those that took place after the country’s defeat in 1945, often challenged the prevailing culture in the country. It was judged to be too feudal and backward in comparison to other democratic countries, especially those in the West. During the the period of strong economic growth, the debate had evolved so as to present the Japanese people as uniquely different. “This idea, driven notably by businessmen, always stressed the originality of Japanese culture, to the point of insisting that it was difficult for foreigners to understand it”, recalls Yoshida Kosaku, a researcher at Sophia University. This concept, which was a way of highlighting the superior quality of their own culture, would be replaced after the 1990s by the idea of the excellence of Japanese culture. “This latter idea gained a certain notoriety abroad, and the global elites realised that cultural differences could indeed be economically beneficial”, he continues. This led to the appearance of the “Nippon Sugoi” trend. It reached its height with the reports in the foreign media praising the stoicism and resilience of the Japanese after the tsunami in March 2011. Hayakawa Tadanori, author of a book about the phenomenon, is alarmed by the analogies that can be drawn between this situation and the widespread debates during the 1930s, which preceded the onset of the Second World War. At that time, “books and posters lauded the excellent qualities of the Japanese people and their culture”, he explains. According to him, those 80-year-old publications mirror exactly those of today, especially in “the way their reasoning is flawed and their lack of objectivity”. For example, in 1933, the anatomist Adachi Buntaro stated that the Japanese were more evolved than Caucasians, because they had less body hair. “We’re surprised by how hairy Westerners are. This demonstrates that they are closer to animals than we are”, he wrote. According to Hayakawa Tadanori, these writings tainted with racism and nationalism reflected the Japanese preoccupation with the West, and especially with regard to the country’s isolation after it withdrew from the League of Nations in 1933. “This phenomenon generated an atmosphere in society that allowed the military government to declare war. “The idea was that Japan, a superior country, needed to save the Asian countries from Western imperialism”, says Hayakawa Tadanori. So, can a parallel be drawn between 1933 and 2017? Some observers consider that the success of “Nippon Sugoi” is a sign of collective anxiety in an increasingly unequal society searching for a vision of its future after the down-turn in economic growth. Hayakawa Tadanori’s main worry is that “this kind of discourse makes it difficult to differentiate between the individual and the State. By reading these articles, people identify more easily with the state”, he thinks. “The traditional arts and the craftsmen praised in these articles and broadcasts may well be outstanding. But that doesn’t mean that the readers are, too. We need to differentiate between them”.